As you may know, I am on the “short side” in a few different ways (be it height, running distance, temper or concentration) – so the thought of even trying to run a marathon just does not even feature for me! 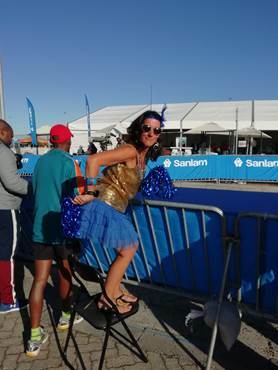 So what else could I do when such an awesome event is hosted in the Mother City and when I belong to such a great club with awesome runners, on all levels……..what to do ??? SUPPORT – CHEER – ENCOURAGE – LOVE – UPLIFT and all the rest of it – that’s what you head out to do !!! So that is what I decided to do at the SCTM on Sunday and what an experience it was. 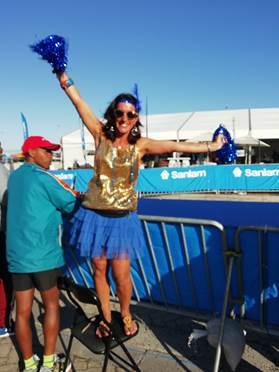 Usually when supporting at a race, I would find myself on the road somewhere, dressed up with pom poms or something silly to shout and cheer the runners along the way. But this year with the new fantastic finish in Vlei Road I thought the end of this grueling marathon would be extra special and a great opportunity to catch these top athletes as they crossed the finish line. There is just something magical about being a spectator – you find yourself among all sorts of people, from all walks of life, almost making new friends for a short time as you discuss who is out there, who you are supporting, what times you are watching for, how you fit into this whole spectacular event…..and you ramble on with so much enthusiasm and excitement but then have to laugh when the questions get too technical and fly over your head! But the buzz is just contagious – you don’t know where to watch, be it on the big screen, on your new friend’s cell phone (who is watching it live on SABC2), on the race App – or just keep your eyes peeled on that one corner… And then it happens and it is like the Mexican Wave – where the supporters further down the blue carpet start to cheer and you realize that something is happening! You can’t contain yourself and you just start clapping, cheering and shouting all sorts and get caught up in all the emotion around you, with your new found friends for the morning! The energy levels just rocket! It is goosebumps stuff, watching those long legged lithe bodies cross the finish line in just a matter of a couple of hours – and many of them still looked so strong as if they could have just kept on going. It’s amazing when you stop to think for a minute what they had just endured and in the time frame too! Record breaking stuff too – what an experience. As time ticks by, the sun is baking your body, your feet start to ache, you need the toilet, you’re hungry, but you are just too scared to move from your spot for fear of missing out! And I hate suffering from FOMO !!! So you knyp, ignore the hunger pains and carry on cheering your heart out. I am not sure who actually heard what when they came running past our noisy bunch – but I will say, it was super rewarding when you are cheering for a random runner, who might be taking strain, who probably felt like just collapsing right there in front of you – but you shout out his club name and/or his name (if you can see it) and you get an acknowledgement of a wave or a smile….and then you just tell them how awesome they are! For me – that’s just the best!!! It may have lasted only 2 seconds but you know that someone appreciated your shrieks and cheers – and THAT is what support is all about – making a difference, bringing a smile, that little bit of oomph when you maybe needed it most. Of course the shrieks were that little bit louder when a familiar face came through – and I stood almost in awe watching the red, white and blue vests run past me. 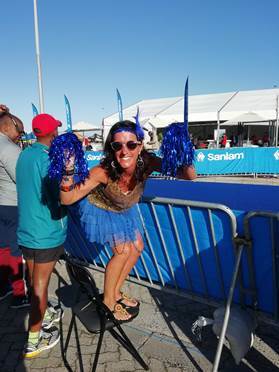 I felt like a proud mom almost – a mom to I dunno how many crazy WC peeps – and I even had many Gugs ladies in on my WC cheering – it was just awesome! So here’s to many more silly outfits and screaming and shouting – this is what I love doing most and can’t wait for the next !! !